Welcome to version 1.8.x of Little Outliner. This is a rundown of the new features in this release. This is a short doc that shows how to create and edit a "status center" page like trumpstatus.org. First, you create and edit the outline using Little Outliner. Log on to the site. Create a new outline called myStatus.opml. Add a few top level headlines, and then a few second-level headlines underneath them. It doesn't have to be much. If you want, you can import the OPML from my outline, using the Import OPML command in the File menu. That will give your status center a lot of starting material. When you're ready to view it as a status center, make your outline public, by choosing Get public link from the File menu. 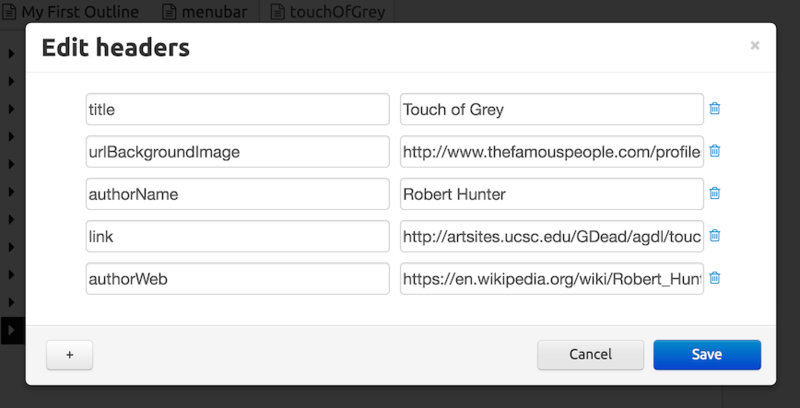 Click OK to confirm, and then OK to dismiss the dialog that appears with the URL. Then choose Status Center from the (new) Build sub-menu of the Outliner menu. It will open a new page with your status center page, ready to be shared with other people. That's it. You can go back and edit the outline and it'll automatically update the status center. You probably want to change the title at the top of the page. For that, choose Set title & description in the File menu. A dialog appears. In that dialog, the "long" title appears at the top of the page, and the short title appears in the title of the HTML. Note that unlike changes to the outline itself, which are automatic and real-time, these changes require that you re-build the status center outline. If so, here's a view-source link for the template for status centers. It's not open source, because it would take a lot of work to make it open source, and I don't have time. But the code is there as sample code. You are free to use any of it. The idea is very simple. It takes an OPML file and converts it to JSON, and then passes it through an outline renderer. You can probably get a lot done just by hacking the CSS, but you're free to change any of it. If you want to make your own OPML, there are a number of outliners out that there that generate it, for example OmniOutliner on the Mac, I'm told is very nice (my friend Brent Simmons is working on it these days). You can if you must write the OPML by hand, but I don't recommend it. Sort of spoils the flow. However, if you use your own outliner, you have to modify the source (see above). The modification is brain-dead simple. Just replace the URL of my outline with the URL of yours. If you have question, post a comment below. Be sure to include the URL of your status center so we can see what you're talking about. Listicle is the first app for Little Outliner. And for now it takes a little bit of manual glueing-together to get the app installed. I expect this will get smoother over time. If you haven't already created a menubar, do so now. Create an outline called menubar.opml. Add a top-level headline called Scripts, and underneath it create a headline called Listicle. With the bar cursor on the Listicle headline, created above, click the suitcase icon in the left margin to edit the headline's attributes. Add an attribute called urlApp with the value http://listicle.io/dave/app.json. Pause, then pull down the menu. You should see a sub-menu under the Listicle item. The first item should be Build listicle and the second should open this page of docs. To test it, create a new outline. You can put anything you like in the outline. Here's the outline I used for my demo. It can be a list of your favorite movies. The outline must be public. To make it public, choose Get public link in the File menu. When you're ready to try it out as a listicle, go to the Scripts menu, Listicle sub-menu, and choose Build Listicle. Confirm you want to build this outline. If it works it will open a new tab with the listicle in it. Use the arrow keys to go back and forth, or if you're on a phone or tablet you can swipe left and right. There are left and right arrow icons at the top. It couldn't be easier. When you edit the outline, the listicle automatically reflects the changes. It's live. (My favorite feature.) It means you can possibly use the listicle as a way of liveblogging. Something to consider. If you want to edit the options for the listicle, its title, background image, etc, choose Edit OPML head in the File menu. These are file-level attributes for the outline. That's where the listicle software looks for various settings. Here are the ones you're most likely to set. title, the title at the top of each page. link, the page the title points to. authorName, obviously the name of the author. authorWeb, the address of the author's website, the page that the author's name points to. urlBackgroundImage, the address of a JPEG, GIF or PNG image to use as the background for the listicle. opacityBackground determines the darkness the background of the text in the listicle. 0 is totally clear and 1 is black. itemLabel determines what it says in the permalink above the title of each page in the listicle. The default is Idea. You could change it to Epiphany or Theory as examples or whatever. urlParamName is the name of the parameter we put on the url after the ? to link to individual slides. If you change this you may break incoming links, but if you don't like the default of idea go ahead and party. Here's a screen shot of the header attributes for the demo listicle. If you have any questions or see any problems, post a note in a comment below. A new + icon in the left margin creates a new headline in a calendar structure. Here's a short video demo of the feature.